Communite, a new dance-centric event that takes place January 13 in Tulum, Mexico, is meant to serve as a pointed rebuke to much of modern festival culture. “It is vital to develop a responsible awareness with the importance of energy, nature, and human relations,” the press release states, “all geared towards cultural evolution. There is a demand for a sense of belonging and collective identity—a need to speak the same language… this is why an idea of creating a timeless community of music enthusiasts in the Mayan Riviera was born with a group of 100% local Mexican producers and curators… in contrast with other projects, cultural unity and social and environmental responsibility are paramount.” Part of ticket sales for the event will be channeled to local families in an effort to help them get potable drinking water. The wide-ranging lineup makes sure to emphasize Latin American sounds from a group that includes Nicola Cruz, Matanza, Jonn & Juann, and Tin Maaaan. It also involves performances from two of Detroit's finest dance music veterans, Moodymann and Andrés. Before he emerged as a purveyor of glistening house tunes and great Michael Jackson edits, Andrés worked as the DJ for J Dilla's group Slum Village. 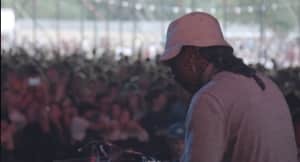 Watch a pretty teaser clip for the festival here, and revisit the excellent Moodymann/Andrés collaboration "Lyk U Use 2" below, which evokes classic Prince.